Mobile charging station for 36 devices with integrated system for touchscreen. Mobility in school environments, interaction with digital systems, new technologies, flipped classroom, groupwork sharing. The innovative TeachBus All-in-One, the world's unique mobile charging device, can be used in multiple applications. 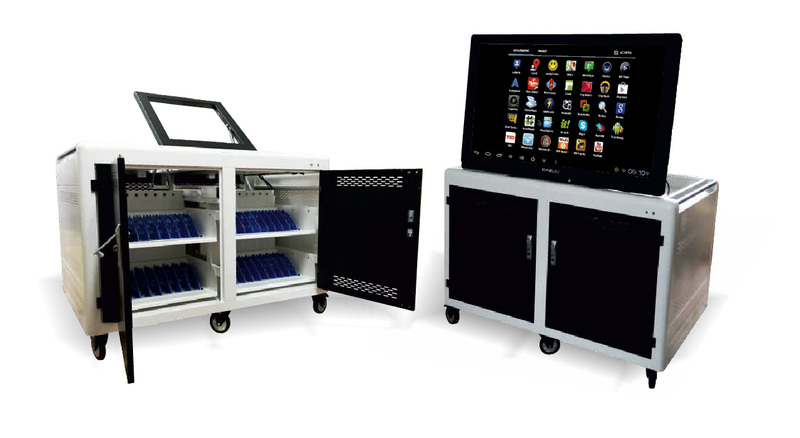 In addition to programmed charging, safe storage and mobility in tablet/notebook environments, an interactive Dabliu Touch 55” touchscreen (not included) is installed on the top of the TeachBus. The interactive 55 "monitor in horizontal position can be used as an interactive table for sharing groupwork. By activating the electric control, the monitor is brought upright to embark on an engaging presentation/frontal lesson.